MIG -- mobile industrial gateway. 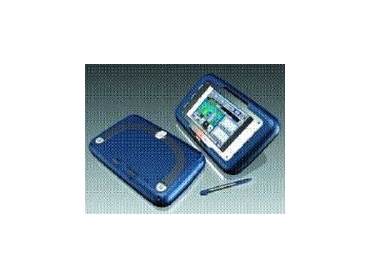 THE MIG handheld, wireless computing device from Control Synergy operates with Microsoft Windows CE.NET. It is rugged, drop, dust and splash resistant to IP54. The high power, rechargeable battery provides five hours of continuous usage even when powering a wireless LAN card. A unique feature is the cradle connector which doubles as an expansion port to connect to a wide array of accessories, for example mobile GPS, network diagnostics, video, digicam, barcode and biometrics, or build your own third party cradles for applications within your domain knowledge. The ability to retrieve data anywhere through a PDA is commonplace and has clear benefits in the industrial realm but most PDAs aren't designed to withstand the abusive conditions found in these applications. Now, thanks to the MIG, mobile applications in harsh conditions can be deployed simply, effectively and cost effectively.